It has been an amazingly long time, almost a year, since my last post here. I will write more about my time away soon. First review of the year (!) will be on Middle Fish, which is a modern Asian cafe with a distinctive Melbourne feel, not unlike popular hangouts such as Cookie and number one on Urbanspoon "Talk of the Town", Chin Chin. Location: 122-128 Berkeley St, next to the Law Library at Melbourne University, right next to the popular Seven Seeds cafe. It's sort of easy to confuse one with the other, since their decor and even menu are so similar in style! Website: no official website, but there you can become their Facebook fan, or check out Urbanspoon for a whole range of blog reviews. Price: averaging at ~$5 for drinks, $7 for entrees, $15 for mains, see here for the menu (may be outdated, specials seem to change quite frequently). Below is a sample of their specials menu. Food: these were the meals from two separate sittings! Thai style iced tea - I've always found the bright orange colour of Thai iced tea appealing, and the taste intriguing. This was light and refreshing, not too sweet, not to bitter, and an interesting combination of spices and tastes I can't pick apart. According to net sources, apart from black tea and condensed milk, spices such as star anise and tamarind seeds are often added to this drink. I can't recall the pricing but it was about $4.50; can anyone can enlighten me on why iced drinks tend to be more expensive than their hot counterparts? Banana roti served with sweet condensed milk - $7 on the entrees menu. I loved roti (flat bread) during my time in Singapore, but have typically eaten it Indian style with curry. However, I did come across banana roti and condensed milk during my holidays in Thailand, so it must be an authentic dish! As for the dish itself, the roti was crispy, but generic, and the condensed milk was a nice combination, if you accept that condensed milk will always be too sweet. Roti with satay sauce - $5.50 (this is on the second visit with my phone camera rather than my regular camera). 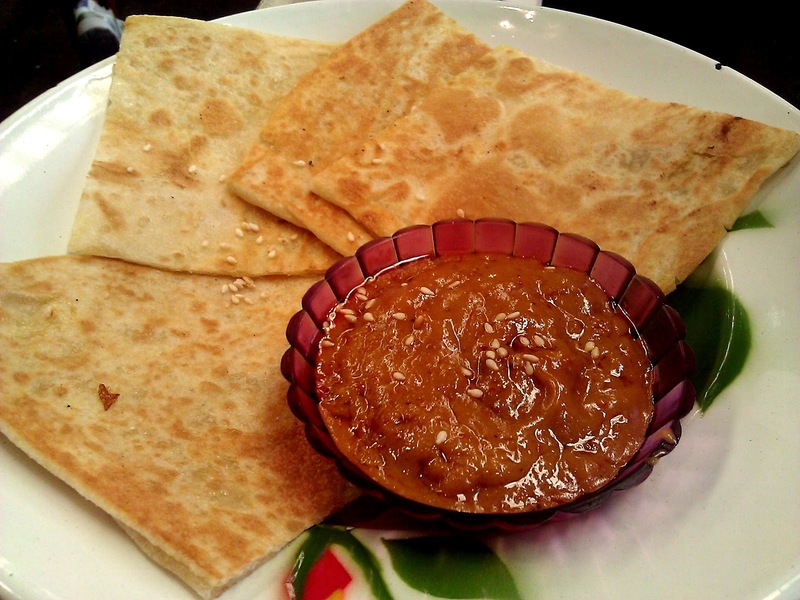 Enjoyed the addictive peanut rich satay sauce, roti was not too different from the sweet type. 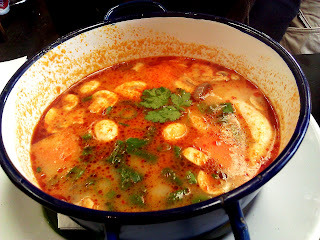 Tom yum - I guess pad thai (which I'm surprised is not on the menu) and tom yum are some of the best known Thai dishes. Tom yum is a sour and spicy soup which comes in various forms, and in this case the soup includes ingredients of "tiger prawns with tomatoes, wild mushroom, spring onion, coriander, lemongrass and kaffir lime leaf", served with rice. The flavours of the broth were rich, being just sour enough to be thrilling but not overwhelming, and the servings and ingredients were generous - this has to be one of the best tom yum soups I've come across in Melbourne! Only downside was that the soup was only mildly spicy. But that might be a good thing for those who don't like spicy foods. 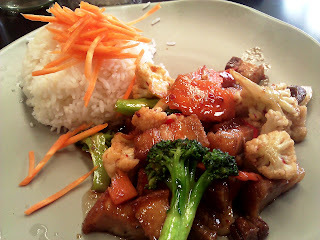 Crispy pork belly with chilli - this dish was on the specials menu, and may have had a complex Thai name. But is probably not too different from the crispy pork belly stir fries on the regular menu. I keep ordering pork belly at restaurants, and this is average on my scale - crispy enough, not too dry, but the skin was chewy. The sweetish spiciness of the chilli balanced well with the pork, and I liked how there was a decent mix of vegetables (just so that I could pretend that the meal is a healthy one). Other: I liked the range of seating from small tables for two, to large group seating on comfortable couches. The store has quirky decorations such as stacks of chilli sauce and other condiments on a bench at the back, and use of bright painted metal bowls and cups (which used to be common in Asia). The location makes it a convenient gathering place for small group meet ups, and a welcoming alternative to Union House at Melbourne University, or the various cafes of nearby hospitals. Rating: 4/5! Middle Fish has a fun and chill feel - but for that, you pay double the amount you would compared to the surrounding Asian cafes. I enjoyed the food and rich flavours, although I imagine it is more fusion than strictly Thai. Would definitely visit again!